We’ve made it super easy for you to purchase your copy of ‘Trout Rising’. We use PayPal for our ordering and check process. PayPal is the world’s safest and easiest way to shop online. Simply click on the PayPal button below. You’ll be taken to PayPal’s secure order page, where in just a few clicks you can place your order. You’ll see my company name on the order form (Long Road Productions – yes, it took me a long time to get here!). We ship frequently, so your order should arrive within 10 – 14 days. Thank you for ordering a copy of my book ‘Trout Rising’! Hi, I’d like to buy but the shipping to the UK is expensive! Is there any UK distribution? 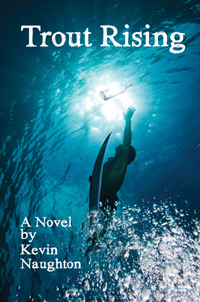 Hi Surfergrl, and thanks for the interest in Trout Rising. At this time there is no UK distribution set up, but I hope this changes in the coming months as reviews come out in the Irish and UK magazines. You can log onto Trout’s facebook sight as a friend and in the next week or so I’m going to set up the Paypal account to offer a discount on the purchase of the book for facebook friends. That’s the best I can do for now, as the shipping costs are what it cost me to ship the book.